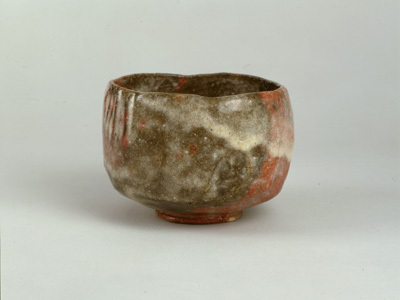 The bowl is rather shallow with a gentle round contour. 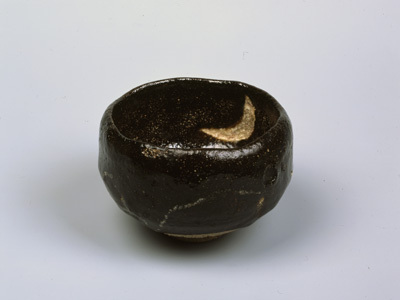 The interior bottom has an area not coated with the black glaze to purposely design a crescent moon shape. “Suga” is the name of Kônyû's wife. This bowl is one among a series of 300 bowls produced to commemorate 300 years' anniversary of the death of Chôjirô in 1890 when Kônyû was 34 years old. It bears the Raku seal specially made for the anniversary by Rokurokusai, the 11th head of the Omote Senke. It is an example of incense container made in the shape of one of the twelve Chinese zodiac signs. Many of Raku generations produced incense containers associated with twelve zodiac animals. 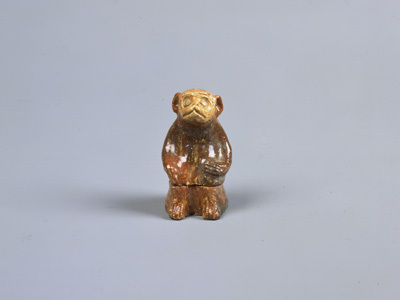 This example is particularly charming with a humorous expression of the monkey.